Many of the approaches that we've discussed to distributed computing involve a "special" machine that has a unique role or purpose within the system. In the past, we've said that the special machine is "appointed" by an administrator, or, to improve availability can be "elected." Although we've never described the process, we did say that elections typicaly occured initially, and/or in the event of a failed coordinator. Today, we're going to discuss how coordinators are "elected." Please note this very subtle distinction in nomenclature -- "voting" is used in the context of synchronization; "election" is used in the context of coordinator selection. When it comes to synchronization, the selected process needs to know that it can enter the critical section, and the other processes need to know that they cannot enter the critical section. But it is not necessary for any process, other than the selected process, to know who has been selected. In contrast, all participants must know which process is the coordinator. When it came to synchronization, we discuss fault tolerance, but only as an issue of secondary importance. In reality, none of the approaches were terribly robust (failure w/in critical section, &c). But election is a process that is typically used in the event of failure -- otherwise an "appointed" coordinator would suffice. So fault tolerance is of primary importance in coordinator election. Both of the election algorithms that we will discuss will assume that version numbers, &c are stored on a stable store and can be restored after a crash. Stable store bight be a hard drive, network drive, non-volatile RAM, &c. This assumption is typical for election algorithms, even those that we don't discuss. All messages are delivered within some Tm units of time, called the message propogation time. Once a message is received, the reply will be dispatched within some Tp units of time, called the message handling time. Tp and Tm are known. These are nice, because together they imply that if a response is is not received within (2*TM + Tp) units of time the process or connection has failed. But, of course, in the real world congestion, load, and the indeterminate nature of most networks make this a bit of a reach. The idea behind the Bully Algorithm is to elect the highest-numbered processor as the coordinator. If any host thinks that the coordinator has failed, it tries to elect itself by sending a message to the higher-numbered processors. If any of them answer it loses the election. At this point Each of these processors will call an election and try to win themselves. If none of the higher-ups answer, the processor is the highest numbered processor, so it should be the coordinator. So it sends the lower level processors a message declaring itself the boss. After they answer (or the ACK of a reliable protocol), it sends them the new state of the coordinated task. Now everyone agrees about the coordinator and the state of the task. If a new processor arrives, or recovers from a failure, it gets the state from the current coordinator and then calls an election. Let's assume that in practice communication failure, high latency, and/or congestion can partition a network. Let's also assume that a collection of processors, under the direction of a coordinator, can perform useful work, even if other such groups exist. Now what we have is an arrangement such that each group of processors that can communicate among themselves is directed by a coordinator, but different groups of processors, each operating under the direction of a different coordinator, can co-exist. The Invitation Algorithm provides a protocol for forming groups of available processors within partitions, and then creating larger groups as failed processors are returned to service or network partitions are rectified. The Invitation Algorithm organizes processors into groups. Ideally all processors would be a member of the same group. But network partitions, and high latencies yielding apparent partitions, may make this impossible or impractical, so multiple groups may exist. Each functioning processor is a member of exactly one group. A new group may be formed to perform a new task, because the coordinator of an existing group has become unavailable, or because a previously unreachable group has been discovered. Groups are named using a group number. The group number is unique among all groups, is changed every time a new group is formed, and is never reused. To accomplish this, the group number might be a simple sequence number attached to the processor ID. The sequence number component can be incremented each time the processor becomes the coordinator of a new group. Since the goal is to have all functioning processors working together in the same group, the groups that resulted from network partitioning should be merged once the partition is repaired. This merging is orchestrated by the coordinators. The goal of every coordinator is to discover other coordinators, if they are accessible. To achieve this coordinators "yell out" perodically to each processor asking each if it is a coordinator. Most processors, the participants, reply indicating that they are not a coordinator. It is possible that some coordinators are unreachable or don't reply before some timeout period -- that's okay, they are perceived to be non-existent or operating in a separate partition. Once one coordinator has identified other reachable coordinators, the goal is for the coordinators to merge their groups of processors into one group coordinated by one coordinator. Usually, it is acceptable to say that the coordinator that initiated the merge will be the coordinator of the new group. But it might be the case that two or more coordinators were concurrently looking for other coordinators and that their messages may arrive in different orders. To handle this situation, there should be some priority among the coordinators -- some method to determine which of the perhaps many coordinators should take over. One way of doing this might be to use the processor ID to act as a priority. Perhaps higher-numbered processors ignore queries from lower-level processors. This would allow lower-level processors to merge the groups with lower priority coordinators during this operation. At some later time the higher-level coordinators will each act to discover other coordinators and merge these lower-priority groups. Perhaps receiving the query will prompt the higher-level coordinator to try to merge its group with others sooner than it otherwise might. An alternative would be for a coordinator only to try to merge lower-level coordinators. Or perhaps processors delay some amount of time between the time that they look for other coordinators and the time that they start to merge these groups. This would allow time for a higher-priority coordinator to search for other coordinators (it knows that there is at least one) and ask them to merge into its group. If after such a delay, the old coordinator finds itself in a new group, it stops and accepts its new role as a participant. In this case, it might be useful to make the delay inversely proportional to one's priority. For example, there is no reason for the highest-priority processor to delay. But the lowest priority processor might want to delay for a long time. In either case, once the merging of groups begins, processing the the affected groups should be halted -- the state may be inconsistent. The coordinator that started the merge operation will become the coordinator of the new group. It should increment the sequence number of the group ID and tell the participants in its old group. It should also tell the coordinators that it discovered to merge their partiticpants, and themselves, into the new group. Once this is done, the new coordinator should coordinate the state of the partipants, and processing can be re-enabled. 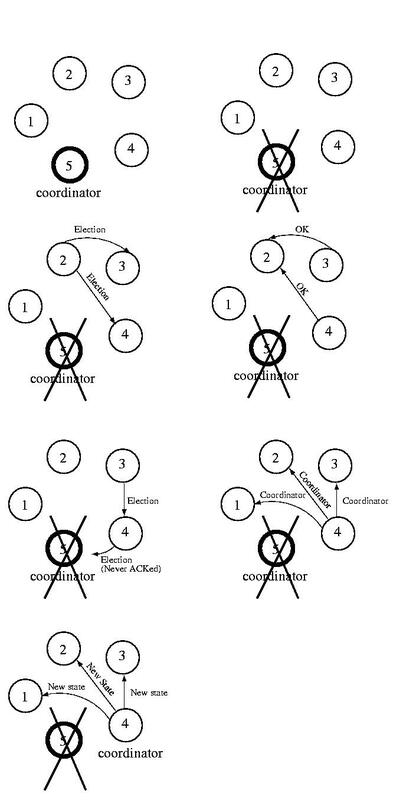 If a node discovers that its coodinator has failed, is newly installed, or returns to service after a failure, it forms a new group containing only itself and becomes the coordinator of this group. It then searches for other groups and tries to merge with them as described above. This approach is really very simple. Periodically coordinators look for other coordinators. If they find other coordinators, they invite them to merge into a new. If they accept the invitation, the coordinators tell their participants to move into the new group and move into the new group themselves. In this way, groups can be merged into a single group. As discussed earlier, the state is consistent within a group, but isn't consistent among groups -- nor does it need to be. This algorithm does not provided global consistency, just relative consistency -- consistency within each group. As such, it is useful is systems where this type of asynchronous processing is acceptable. For example, a coordinator might ensure that participants attack non-overlapping portions of a problem to ensure the maximum amount of parallelization. If there are multiple coordinators, the several groups may waste time doing the same work. In this case, the merge process would throw out the duplicate work and assemble the partial results. Admittedly, it would be better to avoid duplicating effort -- but the optimism might allow some non-overlapping work to get done. Another approach, Ring election, is very similar to token ring synchronization, except no token is used. We assume that each processor is logically ordered, perhaps by IP address, so that each processor knows its successor, and its successor's successor, and so on. Each processor must know the entire logical structure. When a processor discovers that the coordinator has died, it starts circulating an ELECTION message around the ring. Each node advances it in logical order, skipping failed nodes as necessary. Each node adds thier node number to the list. Once this message has made its way all the way around the ring, the message which started it will see its own number in the list. It then considers the node with the highest number to be the coordinator, and this messages is circulated. Each receiving node does the same thing. Once this message has made its way around the ring, it is removed. 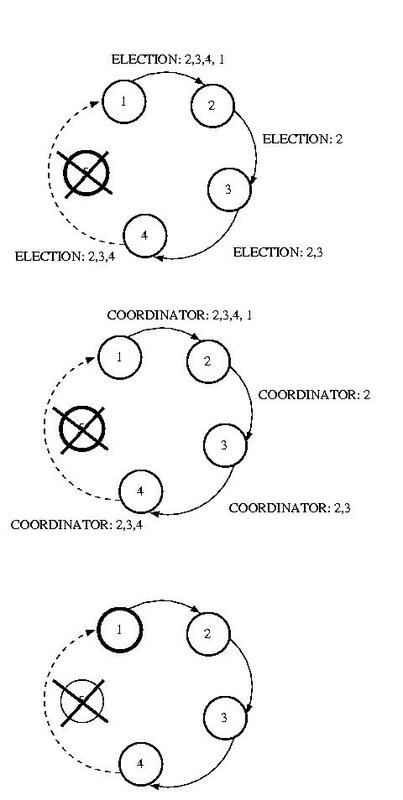 If multiple nodes concurrently discover a failed coordinator, each will start an ELECTION. This isn't a problem, because each election will select the same coordinator. The extra messages are wasted overhead, while this isn't optimal, it isn't deadly, either. The bully algorithm is simply, but this is because it operates under the simplistic assumption that failures can be accurately detect failures. It also assumes that failures are processor failures -- not network partitions. In the event of a partitioning, or even a slow network and/or processor, more than one coordinator can be elected. Of course, the timeout can be be set large enough to avoid electing multiple processors due to delay -- but an infinitely large timeout would be required to reduce this proability to zero. Longer timeouts imply wasted time in the event of failure.